I made some bagels last night. It was my second time using the recipe, so things went pretty well. The boiling process gives the crust an interesting chewy texture I haven’t seen with other bread recipes I’ve tried. 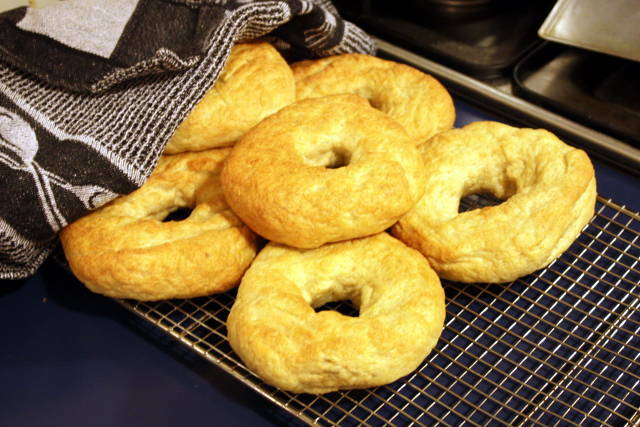 I used this recipe (half wholemeal flour, half white), but made 12 slightly larger bagels rather than the 18 the recipe suggested. I increased the boiling and baking time a bit to compensate. They weren’t particularly difficult to make, but the boiling process was fairly time consuming, since I could only fit three at a time into the pot.